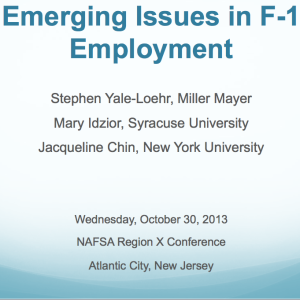 Slides from an October 30, 2013 Powerpoint presentation given at the NAFSA Region X conference. Covers issues such as volunteering, soliciting money online, starting a company, and more. This entry was posted in Employment Issues and tagged F-1 visas, Legal Resources, Unauthorized Employment. Bookmark the permalink.